Click the photo above to see my images on Flickr. Read the descriptions to learn more about the collaborative process of painting and installing this mural together as a community. 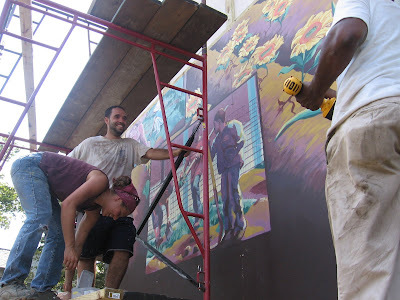 There are also photos of our Mural Celebration held on July 19th, 2008. Sometimes, I forget about the mural and then as I'm walking to Rt. Aid or going up 6th Street to chat w/ the Courtland folks, I'm so struck... WOW. There it is. It's still new to us here in Hunting Park. I suppose we'll get used to it eventually. Come see it! I was so thrilled to see this gorgeous mural in person! It's such a thoughtful, hopeful piece of art, full of meaning. And it just jumps out at you! It's among the loveliest of Philly's murals.